Enrollment is currently at 162 students. St. Mary Catholic School will not discriminate on the basis of religion, race, color, handicap, or national or ethnic origin in the administration of its educational policies, admission policies, and athletic or other school administered programs. However, St. Mary Catholic School reserves the right to refuse admission to any student who has been expelled from another school, who would pose a threat to the health, safety or welfare of other students, or who has a history of classroom disruption or whose behavior would likely disrupt the learning environment. Such students are better served in schools that have teachers and support staff trained to handle their special needs. The decision regarding this ability to appropriately meet the needs of a particular student will be left to the discretion of the principal. Children who have gone through the Montessori or the Pre-Kindergarten preschool programs. 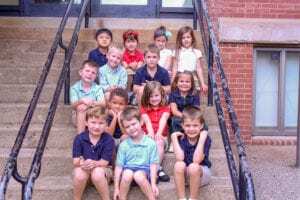 Children from families with other children already enrolled in St. Mary Catholic School or children who have graduated from St. Mary Catholic School. Children now reaching school age. The above children will have precedence in registration in order of years registered in the parish. Equally qualified applicants will be admitted on a first-registered basis by date of registration. Children from non-parish families having other children already enrolled in the school. Transfer students from other Catholic schools. From parish schools now closing. From parishes not offering a full program of grades K-8. Children from non-parish families who have no other children already enrolled in the school. A non-refundable registration fee, the amount of which is stipulated on the Registration Form/Tuition Agreement for the current academic year, is due at the time of registration. 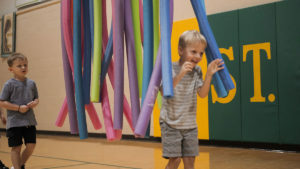 Once a child has been accepted for admission to the preschool or school aged program, that child will remain on the rolls until the student graduates, or transfers to another school prior to graduation, or is refused continued enrollment because of threats to the health, safety, or welfare of other students. Students will also be refused continued enrollment if tuition and/or fees from the previous year are in arrears. Tuition assistance is available for students whose parents are registered, contributing members of the parish and who are unable to pay full tuition. Financial aide applications are available in the school office. full payment at the beginning of the year. There is a 3% discount of tuition if payment is received prior to the student’s first date of attendance. The discount does not apply to fees. Automatic charge to a credit card and/or debit to a checking account are options for payment of tuition. Charges or debits will be made according to the tuition payment schedule chosen by the parent. If a tuition payment option is not specified, the 10 monthly payments schedule will be automatically assigned. Questions concerning tuition and fees should be addressed to the business office at the school. The telephone number is 740-374-8181. The registration fee is due at the time of registration. The computer and materials fees are due by July 15 of the current school year or upon enrollment for students entering St. Mary School after August 1st. Fees are non-refundable unless the child is not accepted for enrollment. If a student leaves St. Mary prior to the end of the school year, any pre-paid tuition and pre-paid milk will be refunded. There will be no refund of fees. Tuition will be pro-rated for students transferring to St. Mary after the first day of classes. However, fees will not be pro-rated for students entering St. Mary after the first day of school. Any account delinquent over ninety (90) days will result in a student’s report card being withheld until the account is brought current (1st, 2nd & 3rd grading periods). The final report card for the year will be withheld until tuition and fees are paid in full. When students transfer to a new school, no school records, including transcripts, will be released until fees and applicable tuition are paid in full. The parish subsidizes tuition for children of St. Mary parishioners. For this reason, parents are obligated to work a designated number of school bingos each year. It is very important that all parents who are members of the parish honor their responsibility to assist with bingo. With the tuition subsidy, you are directly benefiting from the money raised from bingo. We need your help for the program to be successful. Schedules and instructions for bingo assignments will be distributed on a regular basis. Other volunteer activities are genuinely appreciated, but they do not absolve a family of the bingo obligation. A child entering the preschool program must be 3 years of age by September 30th. A child entering the Pre-Kindergarten program must be 4 years of age by September 30th. Children must be toilet trained before they can be admitted to either of these preschool programs. Parents must complete these physical forms prior to enrollment. A child entering Kindergarten must be 5 years of age by September 30th. Early admission can be considered for students who turn 5 years of age between October 1 and December 31. The decision regarding early admission will be made by the principal and the kindergarten teacher subsequent to evaluation of the child. Early admission is an option for a child who demonstrates advanced intellectual, academic, social, emotional and physical development. A child entering the first grade must be 6 years of age by September 30th. A student must successfully complete kindergarten before entering the first grade. The decision regarding this waiver will be made by a committee appointed by the principal. The first grade teacher and the principal will be standing members of the committee. The principal may appoint other members. Upon initial entry to St. Mary School, the student will present all documents required by the Ohio Department of Education, including but not limited to a birth certificate or other acceptable document, immunization records, and copy of the custody agreement when parents are divorced or legally separated. "Attending St. Mary Catholic School had a huge impact on my success at Parkersburg Catholic High School. St. Mary's gave me the tools that were needed to transition into high school such as an excellent background in subjects such as English, Math, and Science. In addition to the challenging curriculum, St. Mary's gave me friendships that will last a lifetime. The intimate class sizes allow teachers to assist their class in ways that public schools can not. The teachers at St. Mary's care about their student's success. To this day, my former teachers at St. Mary's check up on me and continue to support my journey as a student." "My name is Christy Minard, and my husband Alex and I have had three children at St. Mary School. My oldest just graduated from eighth grade this year. We started her at this school because we wanted her to have a solid start for reading in kindergarten. We thought we would switch to Washington Elementary after one year since we are not Catholic. Her kindergarten class was going to have twelve students here which seemed like a fantastic student teacher ratio. Well, her first year went so smoothly and we loved the teachers and faculty so much that we never switched. That was nine years ago. My third child just completed kindergarten, and I'm looking forward to eight more amazing years there for him. The thing that I have been the most impressed with about the school is the academics. I have no doubt that as my oldest heads into ninth grade at Marietta High School, she is very prepared." "Enrolling our daughters at St. Mary Catholic School was the best choice that we could have made for their educational, social, and spiritual development. Our only two regrets are that we did not know about the school earlier and that they cannot stay longer. St. Mary provides the challenging educational environment that our children require while at the same time, accommodates their very diverse learning styles. With outstanding faculty, not only in core subjects like Science and English but also in classes like Music and Art, the education that the girls have received has been an excellent return on our investment. Socially, the girls were welcomed by their classmates since day one and have had opportunities to participate in sports and organizations like student council that are not always available to all students attending public school. We are also extremely pleased by the involvement of and support for the school by the clergy from both the Basilica and Steubenville Diocese. With this multi-faceted approach to education, we know that our daughters will finish their time at St. Mary Catholic School not only as good students but as good Christians. 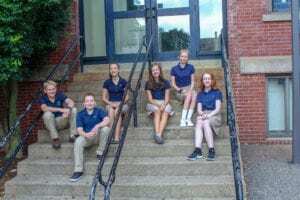 We would encourage anyone pursuing the best education possible for their children in the Mid-Ohio Valley to consider St. Mary Catholic School." We, the St. Mary Catholic School Community, are a parish parochial educational institution built on a strong heritage that challenges us to high expectations in Christian values as well as in academic, service, and extra-curricular areas. Our Catholic school environment, which is open to all young people, nurtures the goal that we as students, family, staff and parish are to be lifelong contributing members of the Church and society.